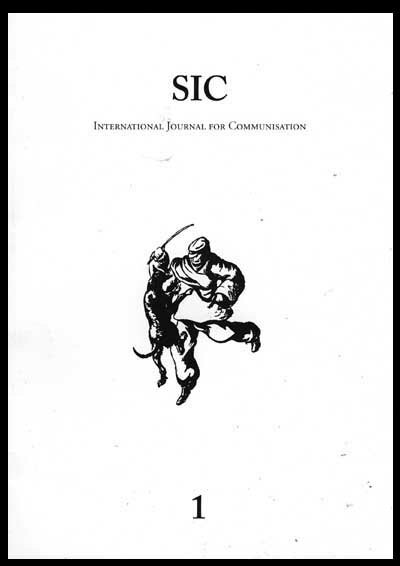 Issue 1 (November 2011) of Sic – a new journal on communisation from Endnotes, Blaumachen, Théorie Communiste, Riff-Raff and more. Cool. I was gonna put this up because the font on the original was headache inducing! Could you please make a pause in the copying? The guy who is working on that website is not finished yet and there are a couple of texts that need to be updated as well. /P.Å. No problems, would you be able to let us know when the updates are finished? Will happily update anything that's already on here as well! I would also encourage people to buy a copy if you're into the texts, because the hard copy looks amazing. I don't know where you can buy them from, do you know suitsmeveryfine? The "Editorial", "How one can still put forward demands…" and "Indignados in Greece" are the texts that need to be updated to correspond with the printed version. I hope these updates will be made soon. I'll post a message here as soon as I know. I'm very glad that you like the hard copy. I haven't got hold of one myself as the issues haven't reached Scandinavia yet. As for buying the issue, my answer is again: soon. Right now you should be able to find copies in London and in Paris if you know the right people . Personally I had wanted the texts not to be published online until all of these issues had been resolved, but someone was obviously impatient. I've now uploaded all the up to date texts here if you want to copy them over to Libcom. The Editorial needs to be updated. Unfortunately there is still no way to order the book, except the French version. Hey, I can only find the articles in French on the Riff-Raff site? Does the Sic site have updated articles on it yet? is their a UK distro for a hard copy of this? The English texts on the riff-raff website are updated; those on communisation.net are not unfortunately. Now, finally, there is a distro in the UK: Active distribution. The English issue can also be ordered from Sweden and the French issue from here. I think some might be printed from Milwaukee in the next month or so if you'd want some sent your way. Email me bout it.